In the picture above, north is at the top and the image covers approx. 50 x 62 degrees. 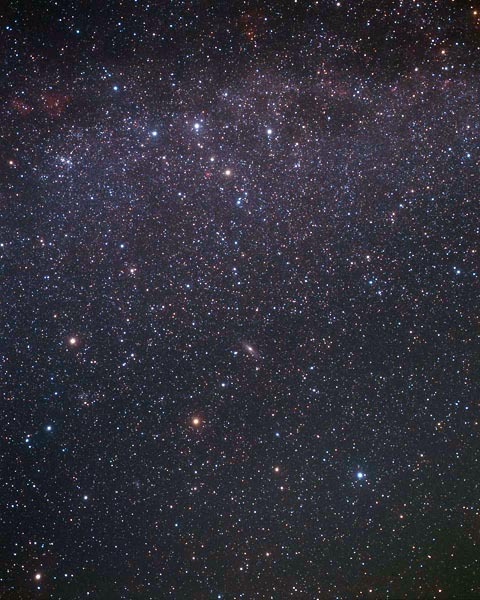 The modern constellation is the 19th largest in the sky and covers about 720 square degrees but is not very obvious. The three brightest stars of Andromeda form a broad arc south of the distinctive 'W' of Cassiopeia, and under a dark sky the elongated shape of M32 is just visible to the unaided eye. This is by far the best-known object in the field. We also have a wider view of Andromeda, including Lacerta and Triangulum. Adjoining constellations: Aries, Cassiopeia, Cepheus, Lacerta, Pegasus, Perseus, Pisces, Triangulum. INT 4. NGC 891, edge-on spiral galaxy in Andromeda.